In the article You Are Not Different, I made reference to the concept of energy balance and it’s time to expand on that concept. In the most simplistic form, we can define energy balance as Energy balance = energy in – energy out. Energy in is food, since this is the only place that human can absorb energy (calories and joules are both measures of energy). That side of the equation is relatively simple, just add up your total caloric intake. Actually it’s not because the different macronutrients are handled a little bit differently from one another so it’s not simply calories, but that’s another topic for another section. Energy out is the topic of the next several chapters but ultimately represents how many calories you expend in a day. Long-term changes in energy balance are what ultimately determine what happens to the body. A long-term excess of energy balance (energy in exceeds energy out) will lead to a gain of body mass; a long-term deficit in energy balance (energy out exceeds energy in) leads to a decrease in body mass. Whether that changed body mass is made up of fat, muscle, or some combination depends on a few factors. It’s the energy out side of the equation, usually referred to as metabolic rate, that I want to talk about now. 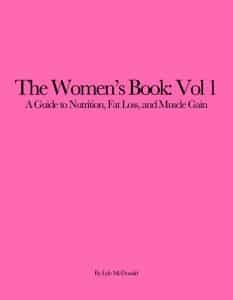 Over the next several chapters, I want to address the various components of metabolic rate, as well as how they are affected by such things as obesity, gender, exercise, diet, etc. This will ultimately lead into a discussion of setting calorie levels for different goals. I’ll be throwing around three letter acronyms (TLAs) like mad in these chapters so be forewarned. Most sources differentiate four different components of total energy expenditure (TEE): basal or resting metabolic rate, the thermic effect of activity, the thermic effect of food, and an adaptive component. Lets look at each. Although many sources tend to use these terms interchangeably, they are not really the same thing. Both roughly represent the number of calories needed to sustain the body’s most basic functions, which I’ll discuss in a second. The real difference comes in how they are measured. Basal metabolic rate (BMR) technically refers to the absolute minimum amount of energy needed by your body to sustain itself. A true measurement of BMR requires that you be sleeping which is impractical (you’ll sometimes see it referred to as sleeping metabolic rate or SMR in research). Instead, most studies and labs measure resting metabolic rate (RMR) instead. RMR is measured in the morning before eating, while resting quietly and generally gives values that are 5-15% greater than true BMR (even being awake means you burn slightly more calories). But it is far more practical to measure RMR in most cases and it’ll be what I refer to from now on. As stated above, RMR refers to the energy needed to sustain the body’s most basic functions. As you sit reading and growing more bored by the minute, literally thousands of cellular reactions are proceeding within your body. Your brain is using glucose for fuel, your eye muscles are using energy as you scan the page, your heart is beating, your muscles are somewhat tense as you sit in the chair. Protein in your muscles is being broken down and resynthesized, as are fatty acids in your fat cells (these are called futile cycles since they don’t really accomplish anything but they do require energy). Your cells are constantly cycling sodium into the cell and potassium out (called the Na/K+ pump) using up energy in the process. On and on it goes and all of it uses energy. So you know, adenosine triphosphate (ATP) is the ‘currency’ of energy used by the body at its most fundamental level; it is the only substance that can be used directly for energy production. Other substances (i.e. carbohydrate, fat, protein and alcohol) are used to produce ATP. RMR is determined primarily by the amount of lean body mass you have. Although it varies somewhat from study to study, the amount of LBM appears to predict roughly 65% of the variance in RMR is attributed to differences in lean body mass. That is to say, more lean body mass will mean a higher RMR and vice versa. Given all other things equal (and they never are), someone with more lean body mass will have a higher RMR. To be honest, total body weight gives a damn good estimate of RMR even if you don’t factor in lean body mass but LBM is probably a better predictor. I want to be clear that here I’m using lean body mass generally to include muscle. organs, brain, etc. Quite in fact, your muscles don’t actually use that much total energy on a daily basis. Despite making up nearly 40% of your total body mass, muscles only contribute about 25% of your total RMR. In contrast, your organs account for nearly 60% of your total RMR because they are so much more active. Contrary to popular belief, fat does use a small amount of calories and also contributes to RMR. It’s not huge mind you, maybe 3 calories per pound but it adds up. Someone carrying 50-100 lbs of fat is burning 150-300 calories per day to sustain that fat. Gender also affect RMR. Bad news for the ladies, on average men have a higher BMR than females. Some of this is simply a consequence of having more LBM. That is, at any given body weight, a male will typically have less fat and more LBM. But even if you factor out those differences (and all of the rest), women still typically run about a 3% lower BMR than men. The cause is probably hormonal, differences in the levels (and sensitivity) to hormones such as leptin, thyroid, insulin, the catecholamines. Even estrogen and progesterone affect BMR slightly. However, it gets even more complicated than that: during a woman’s menstrual cycle, BMR can vary quite a bit. Age also affects RMR, as folks get older, RMR decreases slightly. Some of this decrease is simply an effect of losing lean body mass but some of it probably represents a general slowing down of bodily functions. If you include other variables such as fat mass, gender, and age, you can predict about 85% of the variance in RMR. That is, knowing LBM, fat mass, gender and age, you can predict RMR with about 85% accuracy. That still leaves 15% unaccounted for; that 15% is basically the genetic lottery. But let’s put that 15% in perspective. Say you have two people with an estimated RMR of 2000 cal/day (ignore for now how we’ve estimated it) based on the above factors. That value could actually vary by 15% (300 cal/day) or so. That’s 300 cal total variance or 150 cal/day either way. So you might see actual RMR values as high as 2150 cal/day or as low as 1850 cal/day. This gets into the genetics stuff I talked about very early on in this book and relates to both weight gain and loss. Someone with a low relative metabolic rate (which typically accompanies some other defects such as decreased fat oxidation and problems regulating hunger and appetite) is going to be predisposed to obesity if they are given a typical American diet. As well, given the same type of fat loss diet, they aren’t going to lose as quickly. Either they will have to cut calories more, do more activity (i.e. exercise), or simply accept a slower rate of weight/fat loss. Once again, look at our two folks from above, with a predicted metabolic rate of 2000 cal but a variance of 300 cal/day either way. If we put both folks on a 1500 cal/day diet, we would expect vastly different results. The person with a metabolic rate of 2150 cal/day is creating an 650 cal/day deficit, just over a pound a week fat loss. The person with a metabolic rate of 1850 cal/day is only generating a 350 cal/day deficit, barely 0.5 lbs/week weight/fat loss. To achieve the same rate of loss, the second person would either have to cut calories by 500 (to a piddly 1000 cal/day), increase activity significantly (an hour plus of aerobics or so), or some combination of the two. Research is currently underway to determine what the specific defects are which lead some people to have a lower than normal metabolic rate. While the specific factors haven’t been worked out, it likely represents differences in levels of various hormones (insulin, thyroid, leptin, the catecholamines) as well as overall sensitivity to those hormones. Other genetic variations, for example in UCP (see below) may also play a role. As we’ll see in the next chapter, the decrease in RMR with dieting is partially due to dropping levels of insulin, thyroid, catecholamines and especially leptin. Increases in RMR with overfeeding occur for the reverse reasons. There is some debate over whether exercise affects changes RMR. Some studies have documented a higher RMR (for body weight) in aerobically trained athletes compared to sedentary folks, but others have not. Any effect is likely to be small. Weight training, by increasing muscle mass, should have a small effect on BMR as well although not all studies have shown this to be the case. Unfortunately, the most recent research points out just how small the effect is: at rest, a pound of muscle burns about 6 calories. The old values of 40-100 cal/lb were simply vast overestimations and unless you can add an absolute ton of muscle mass, you’re unlikely to increase resting metabolic rate significantly (not that adding muscle doesn’t have other benefits). Overall, RMR makes up anywhere from 50-70% of your total daily energy expenditure. If you’re wondering about the spread, it has to do with the variable nature of activity. For someone expending a massive amount of calories per day in exercise (think an endurance athlete spending 4+ hours training), RMR will make up relatively (as a percentage) less of the total. For someone who is relatively sedentary, BMR will make up a larger percentage. The absolute amount of calories burned won’t change, mind you, simply the percentage coming from RMR. I’ll give you some more detailed equations in the next chapter but, on average, RMR can be estimated simply by multiplying body weight by 10-11 calories/pound (22-24 cal/kg). So someone weighing 150 lbs has a RMR estimate of 1500-1650 calories/day. The thermic effect of food (TEF, also known as specific dynamic action or SDA or Dietary Induced Thermogenesis or DIT) refers to the slight bump in metabolic rate that occurs after eating, due to processing and utilization of the ingested nutrients. For example, protein has to be broken down and processed in the liver which requires energy. As well, the simple act of eating protein stimulates protein synthesis in various tissues (organs, liver, muscle) as well. All of which takes energy. Carbohydrates get broken down to glucose, which goes through the liver, some processing, etc. Fat undergoes the least processing. There are exceptions such as medium chain triglycerides (MCTs) which undergo quite a bit of processing in the liver, causing a slight bump in metabolic rate (via TEF) in the process. As it turns out, different nutrients have different individual TEF’s. Protein turns out to have the highest, to the tune of 20-30%. Meaning that of the total protein calories you eat, 20-30% is lost in processing. Carbohydrate stored as glycogen requires about 5-6% of the total calories. Carbohydrate converted to fat (which generally doesn’t happen in very significant amounts) uses up ~23% of the total calories as TEF. Most fats have a tiny TEF, maybe 2-3% (because they can be stored as fat in fat cells with minimal processing). Since it’s usually impractical to sit and figure out the individual TEFs for each nutrient, the normal estimate used is 10% of total caloric intake. So if you consume 3000 calories per day of a relatively ‘normal’ mixed diet, you can assume that your TEF is about 300 calories per day or so. You also generally find that, with the exception of extreme diets (such as all protein), shuffling macronutrients has a pretty minimal overall impact on metabolic rate via TEF. For example, consider the difference in TEF for carbs versus fat: 5-6% vs. 3%. That means that, for every 100 calories of each you ate, you’d burn 5-6 or 3 calories. So if you replaced 100 calories of fat with 100 calories of carbohydrates, you’d burn a whopping 2-3 extra calories via TEF. If you replaced 1000 calories of fat with 1000 calories of carbohydrates, you’d burn 20-30 more calories. If you were able, by some means, to replace 2000 calories of fat with carbohydrates, you would burn 40-60 more calories via TEF. One study found that metabolism was about 4% higher (100 calories per day or so) for the higher carb versus the higher protein diet. That still only amounts to an extra pound lost per month or so. Nothing to write home about to be sure. About the only time that TEF can become considerable is when you replace carbohydrates or fat with protein. For every 100 calories of carbs/fat replaced with protein, you’d expect to burn about 25 calories more (30 cal for protein vs. 3-6 for carbs/fat). So a doubling of protein from 60 to120 grams/day might increase TEF by 80 calories/day. Triple it to 180 grams/day and TEF could increase by 150 calories. The 20-30% TEF of protein can become even more significant at extreme intakes. However, for the most part, such extreme intakes aren’t practical or used outside of the bodybuilding subculture. In all but the most extreme diets, protein stays fairly static and carbs and fats are shuffled around; the effect is typically minimal in terms of TEF. Finally, I should mention that some research has found that insulin resistant individuals may have an impaired TEF response to eating, with a rough 50% reduction occurring. This could conceivably become significant. For example, on a 3000 cal/day diet, the estimated TEF would be 300 calories. Cut that in half and you only get a 150 cal/day increase in energy expenditure via TEF. Over a month’s time that would amount to 4,500 calories or about 1.5 lbs difference. I’d assume that correcting the insulin resistance by losing fat, lowering insulin and various other interventions would correct this defect and allow TEF to work normally. The thermic effect of activity (TEA) refers to all activity above and beyond basal levels. If you get off the couch and walk around, that goes into TEA. Do chores around the house, TEA. Go to the gym and work out, TEA. Because of extreme differences in daily activity levels, TEA is the most variable of all the components of total energy expenditure ranging from 10-100% over basal levels. Relatively sedentary individuals may burn a mere 10-30% over BMR during the day. Extremely active individuals (think athletes engaged in several hours of training per day) can burn 50-100% over BMR through activity. This make figuring out TEA a real hassle, simply because of the variance involved. There are some rough estimates but that’s all they really are, I’ll address this in a little bit. The calorie burn from TEA technically comes from two separate factors: calories burned during the activity and calories burned afterwards. Caloric expenditure during activity can be pretty variable. Someone trotting along on the treadmill may only be burning 5-10 calories/minute. An elite athlete may be capable of burning 20 cal/min or more for extended periods of time. Weight training can burn roughly 7-9 cal/min although this depends on the exercises done, number of reps and rest periods. Depending on the duration and intensity of a given workout, the caloric expenditure can range from irrelevant to extreme. First and foremost, there is typically an increase in caloric expenditure (referred to as excess post-exercise oxygen consumption or EPOC) but this tends to be variable as hell. Despite commonly held belief, there is a fairly inconsequential increase in caloric expenditure following aerobic exercise. You may have read that aerobics raises RMR for 24 hours but this happens to be completely false (the studies suggesting this were flawed for a variety of technical reasons). Rather, the amount of bump in RMR (i.e. calories burned after the aerobic session) from aerobics depends on both the duration and intensity of the workout. A typical aerobic workout, done at low intensity for short durations (what one friend of mine calls Weak Assed Morning Cardio since most people do it in the morning) may burn an additional 5-10 calories total after the workout. Yippee. At higher intensities, or taken to exhaustion, the RMR bump from aerobics can approach 100-150 calories total. But this typically requires intensities and/or exercise durations that the average person simply won’t or can’t do. Only a well-trained athlete would be able to accomplish the types of workloads needed to elevate BMR significantly with aerobics, and they don’t generally need to lose fat in the first place. A specialized type of aerobic activity, referred to as interval training (sprint training basically) appears to elevate RMR to a much greater degree than typical aerobic workouts but exact numbers are difficult to obtain. Weight training is a different story entirely. Studies have shown that properly done weight training can raise RMR by quite a bit for anywhere from 24-36 hours. One recent study, using a mere 12 sets measured a total caloric burn of 700 calories over baseline in the two days after the workout. This can add up quickly. I should mention, briefly, one of the great contradictions of exercise: the individuals who really need to burn the most calories with activity (typically overweight and out of shape) usually aren’t capable of it; and the folks who can burn tons of calories (highly trained lean athletes) don’t need it. Of course, given time, untrained individuals can drastically increase their capacity to burn calories during exercise, as their fitness improves (and they lose weight) so this shouldn’t be taken as a reason not to exercise. I’m simply trying to point out some of the realiities. I should note that RMR and TEF are relatively static for the most part, except during the most extreme diets (where TEF and RMR will both crash). A 10 lb muscle weight gain may only raise BMR by 60 calories or so. Ignoring the adaptive component of metabolic rate (see next section), a 10 lb weight loss would only reduce metabolic rate by about 100 calories per day. It’d take eating 1000 extra calories to burn an additional 100 calories via TEF (and you’d still end up with 900 calories extra that would get stored). Those same 100 calories could be burned with 10-20 minutes of moderate to high intensity exercise. I’ll talk about this some more in a few chapters. Excepting massive weight loss or gains, which can affect RMR significantly, perhaps the single place you can most affect caloric expenditure is with activity. The adaptive component of total energy expenditure is sort of a catch-all category for anything that doesn’t neatly fit into the other categories. Even then, the adaptive component (sometimes called thermogenesis which simply means the production of heat) can be divided up into an obligatory component and a facultative component. We needn’t get that detailed. Generally the adaptive component refers to changes in energy expenditure due to environmental changes. It fundamentally represents a change in metabolic efficiency, meaning you are burning more or less calories at the same bodyweight than you’d expect. For example, in cold weather, there is an increase in calorie burn via shivering. Fever or injury can raise metabolic rate by 10% or more due to the increased cellular turnover and hormonal response that occurs. Weight training that causes muscle damage increases the rate of protein turnover, which is a big part of the calorie burn that occurs after the workout. During dieting, in addition to the drop in BMR due to loss of weight, there can be an adaptive decrease in metabolic rate due to hormonal changes (meaning you burn less calories than you’d expect based on the change bodyweight so even though you’ve lost only 10 lbs, BMR may have dropped by far more than 100 calories/day). As it turns out, some people have adaptive drops that are larger than others and this contributes to some of the variance in weight/fat loss between people. However, because of their research into BAT, scientists discovered a new class of proteins called uncoupling proteins (UCPs). To avoid an unnecessarily technical discussion, simply realize that UCPs tend to lead to a wasteage of energy in the mitochondria of cells to generate heat. The first UCP, UCP1 (aka thermogenenin) was found in BAT which I already told you we don’t have much of; we can ignore it. However, two additional UCPs (UCP2 and UCP3) have also been found in human muscle and fat cells. Originally it was hoped that UCP2 and 3 would play a role in humans similar to UCP1 in animals but it doesn’t appear to be the case. Rather, it looks like UCP 2 and 3 are mainly involved in fuel use, especially fatty acid oxidation (burning). When fatty acid levels increase, for example during fasting, UCP levels in skeletal muscle go up to help burn them off. This isn’t to say that drugs (or supplements) that affected UCP might not benefically influence energy expenditure, only that UCPs weren’t the holy grail of fat loss that they were originally hoped to be. A final, and interesting part of the adaptive component of metabolic rate is something researchers have given the cutesy wootsey name of Non-exercise Adaptive Thermogenesis or NEAT (this lets them make all kinds of cute paper titles along the lines of ‘Decreased weight gain, a NEAT explanation’ because scientists are amazingly unfunny). NEAT more or less refers to fidgeting, moving around, basically weird spontaneous movement that burns off calories without really accomplishing much. If you remember back to high school, there was always that one skinny guy who was always fidgeting his hands, bouncing his leg, that kind of thing. He was burning calories at a much greater rate than you might expect. Even chewing gum all day can burn up a lot of calories. It turns out that NEAT can account for 200-900 calories/day of caloric expenditure and there is a massive variance between people in how much change they get. This is especially true during overfeeding; some people ramp up NEAT to super high levels and stay lean, others don’t and get fat easily. To put that in perspective, 900 calories per day is equivalent to about an hour and a half of hard exercise. That’s a ton of calories burned through nothing but fidgeting. Unfortunately, it also looks like NEAT is genetically determined; either you upregulate NEAT during overfeeding or you don’t. One more thing, in this particular study, women consistently had the smallest NEAT response. In addition, it looks like the capacity to increase NEAT is tied to the adaptive downregulation of metabolism during dieting. One study found that the same people who were best able to increase metabolism during overfeeding had the smallest drop in metabolic rate during dieting and vice versa; the folks who’s metabolism went up the least during overfeeding had the biggest drop in metabolic rate during dieting. Researchers referred to this as ‘spendthrift’ (store excess calories poorly, lose weight easily) and ‘thrifty’ (store excess calories easily, lose weight poorly) phenotypes. We might call them the genetically blessed and the genetically fucked. The latter individuals not only have the hardest time losing fat because their metabolisms crash the hardest and fastest, they will tend to store fat the most readily. The changes in overall body mass (increase or decrease) ultimately comes down to long-term energy balance which is represented by energy in (via food) and energy out (via metabolic rate). Total energy expenditure is determined by four components. The first is basal metabolic rate (BMR) which represents the number of calories needed to sustain the basic functions of your body. The second is the thermic effect of food (TEF) which represents the calories expended in processing the food that you eat. The third is the thermic effect of activity (TEA) which refers to any and all calories burned above and beyond BMR. Chores, just sitting up in a chair, and exercise all contribute to TEA. Finally, there is an adaptive component of metabolic rate which is a catch-all category for a variety of different metabolic processes. This includes changes due to environmental factors such as cold, sickness (fever), changes because of increased or decreased food intake, or the cutely named NEAT which is just fidgeting and basic moving around.